After Agents of S.H.I.E.L.D. went on hiatus for most of November, it finally returned this past week with quite the explosive episode. When we watched last, Coulson, Robbie, and Fitz were mysteriously whisked away by a dramatic shockwave. Are they okay? Are they alive? (I mean, obviously--they're right there in the image above this paragraph. But I digress.) Regardless, what even happened last episode? And what even happened this episode? 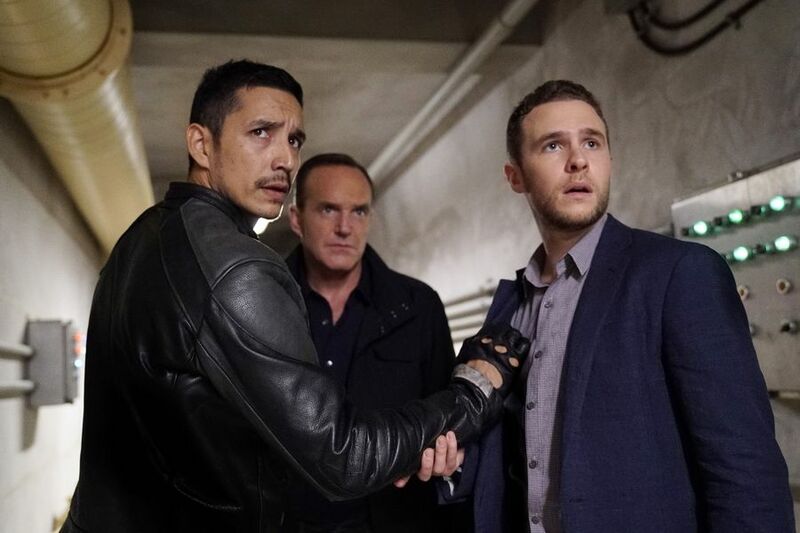 As always, AOS delivered with an episode filled with many twists and turns. So what were the highlights and lowlights? Let's dive in! ★ Oh, there are so many. Are you really surprised? ★ On that note, HENRY SIMMONS, EVERYONE. The latest Ghost Rider and now a man with a score to settle. I'm terrified. Henry Simmons did a great job of personifying whatever/whoever it is that possesses Robbie. (And has now possessed Mack because why not?) Kudos. ★ I am very, very glad that Coulson, Mack, and Robbie are not dead. ★ Aida's gateway was downright amazing. ★ I'm really not sure how to feel about Jemma's whole side plot. I'm peeved with Mace for letting her go off like that, and I'm also quite peeved at the senator. Also, speaking of shipping, I'm really scared that the guy Jemma helped rescue is going to fall for her. And after Will last season, I am not at all prepared for another love triangle. Because... just look at these two. They deserve happiness uninterrupted forever and ever and ever. ★ I don't think I like Revenge!Mack. I swear, can the guy stop hurting for like two seconds and have a break? I need to wrap him in a blanket and give him tea. ★ IS AIDA REALLY CREATING A BRAIN?! REALLY?! My brain jumps to an artificial intelligence army, and it's not pretty. Please say it isn't so. This entire episode had so many funny lines; here are just a few of my favorites. Mace: "So, first we sharpen the axe, and then we chop the tree." Mack: "My axe is plenty sharp--and a shotgun." Fitz: "Oh, nothing, Mack's just the Ghost Rider now, but you can't hear us, so... bloody hell." I put off watching this episode because I was worried about how things would turn out, but I really shouldn't have. This episode was really, really good. It was filled with enough drama to sustain me for a whole week, and it was also a somewhat happy ending as far as Coulson, Fitz, and Robbie are concerned. That doesn't mean the tension is gone, however--far from it. AOS is gearing up for one heck of a season--and they're also setting the stage for something big, I can feel it. Join us next week for a reaction to the winter finale, which will probably leave us in a cliffhanger state of shock. Bring your tissues! Have you seen "Deals with Our Devils"? What did you think?